Sun Tzu was a native of the Ch’i State. 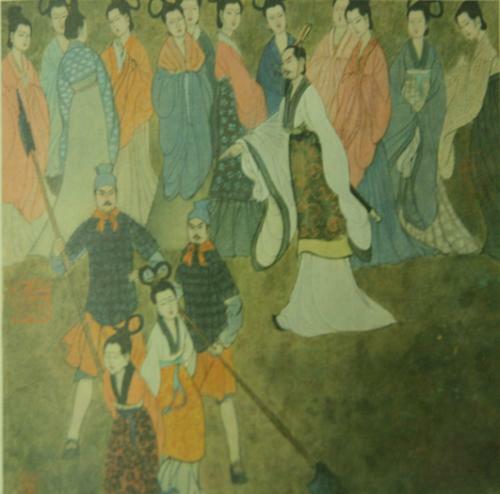 His “Art of War” made him famous and earned the attention of Ho Lu, King of Wu. Ho Lu said to him “I have carefully read your 13 chapters. May I test your theory of managing soldiers? What is Sun Tzu doing? Why does he question himself publicly in front of the king and the concubines? So saying, he ordered the leaders of the two groups to be executed. Now, the King of Wu was watching and he saw that his favorite concubines were about to be executed, he was greatly alarmed and hurried to send this message. What sorts of commands should you ignore from your “kings,” whether those kings be older teachers, the principal of your school or parents of your students? Accordingly, Sun Tzu had the two concubines executed and chose two more concubines to lead the groups of women. When this had been done, he again sounded the drums and began the drills. This time the women performed all of the general’s commands perfectly, turning right or left, marching ahead or marching back, kneeling or standing with perfect accuracy and precision. Then Sun Tzu sent a messenger to the King. Why does Sun Tzu criticize the King? After that, King Ho Lu of Wu saw that Sun Tzu was one who knew how to handle an army and appointed him general. 1. Does Sun Tzu appear cruel to you? If he seems cruel, explain a better way to train the concubines. If he doesn’t appear cruel to you, explain why he was justified in killing the women. 2. Why does Sun Tzu ask the concubines twice? Why doesn’t he execute the concubine leaders after the first failure? 3. Why does Sun Tzu refuse the king’s request to save the concubines? 4. Aside from fear, why do the concubines follow Sun Tzu? 5. What techniques from Sun Tzu can you use to lead? I think trial is basically wrong. They are just concubine who serves the king’s bed time. I really hate the old days’ marriage convention . Women should have tried to do ubermensh. I think that’s kind of big fault for every women in old days. Honestly , I don’t like women ancestor what if they were wrong marriage to let me out of the earth. Concubine became soldiers for king~? If I were concubine, I don’t really want to fight for king. Because king and I are law relationship. We are legitimately equal. He cannot use me a staff for his business.